Audi vehicles are manufactured by the renowned German auto makers, Volkswagen, and are among the most celebrated luxury vehicles in the world. As an Audi owner, you are familiar with the quality of your investment, which is why you are passionate about taking care of it. 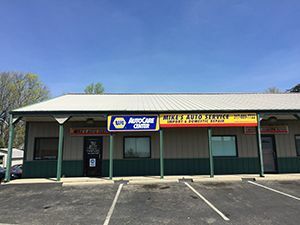 Here at Mike’s Auto Service, we share this enthusiasm for luxury vehicles, which is why we work hard to provide consistent, high-quality, and affordable Audi service and repair in Greenwood, Indiana. Our ASE certified Audi mechanics are highly trained and experienced, and fully-equipped to provide a wide range of car maintenance and repair for all Audi models, including Audi A6, Audi A3, Audi A4, and more. Whether SUV or sedan, we retain the latest technologies and equipment to render expert service in a convenient time frame; and all for much less than the Audi dealership! Our Audi services include everything from factory scheduled maintenance and minor repairs, to major engine work and much more. Call 317-889-7722 today to speak with a friendly office attendant about your Audi service and repair needs.